Why Social Security and Medicare are on the ballot. What will happen if the blue wave in the midterm elections falls short? Clearly, at this point it still might: Democrats will surely receive more votes than Republicans, but thanks to gerrymandering and population geography, the U.S. electoral system gives excess weight to rural, white voters who still have faith in President Trump. What if, thanks to that excess weight, the minority prevails? One answer, obviously, is that the unindicted co-conspirator in chief will continue to be protected from the law. And for those concerned with the survival of American democracy, that has to be the most important issue at stake in November. But if the G.O.P. hangs on, there will also be other, bread-and-butter consequences for ordinary Americans. First of all, there is every reason to believe that a Republican Congress, freed from the immediate threat of elections, would do what it narrowly failed to do last year, and repeal the Affordable Care Act. This would cause tens of millions of Americans to lose health insurance and would in particular hit those with pre-existing conditions. There’s a reason health care, not Trump, is the central theme of Democratic campaigns this year. But the attack on the social safety net probably wouldn’t stop with a rollback of Obama-era expansion: Longstanding programs, very much including Social Security and Medicare, would also be on the chopping block. Who says so? Republicans themselves. In a recent interview with CNBC’s John Harwood, Representative Steve Stivers, the chairman of the National Republican Congressional Committee — in effect, the man charged with containing the blue wave — declared that, given the size of the budget deficit, the federal government needs to save money by cutting spending on social programs. When pressed about whether that included Social Security and Medicare, he admitted that it did. Now, Republicans who call for cuts in social spending to balance the budget are showing extraordinary chutzpah, which is traditionally defined as what you exhibit when you kill your parents, then plead for mercy because you’re an orphan. After all, the same Republicans now wringing their hands over budget deficits just blew up that same deficit by enacting a huge tax cut for corporations and the wealthy. So it might seem shocking that only a few months later they’re once again posing as deficit hawks and calling for spending cuts. That is, it might seem shocking if it weren’t for the fact that this has been the G.O.P.’s budget strategy for decades. First, cut taxes. Then, bemoan the deficit created by those tax cuts and demand cuts in social spending. Lather, rinse, repeat. It’s true that when tax cuts are on the table their proponents tend to deny that they’ll increase the deficit, claiming that they’ll provide a miraculous boost to the economy and that tax receipts will actually rise. But there’s not a shred of evidence to support this claim, and it has never been clear whether anyone with real political power has ever believed it. For the most part it’s just a smoke screen to help conceal the G.O.P.’s true intentions. The puzzle is why Republicans keep getting away with this bait-and-switch. Fifteen years ago I wrote a long piece titled “The Tax-Cut Con,” describing what was even then a time-honored scam; it reads almost word for word as a description of Republican strategy in 2017-18. Yet I keep reading news analyses expressing puzzlement that men who were strident deficit hawks in the Obama years so cheerfully signed on to a budget-busting tax cut under Trump. To say the obvious: These men were never deficit hawks; it was always a pose. And the gullibility both of the news media and self-proclaimed centrists remains a remarkable story. Remember, Ryan, who was utterly orthodox in his determination to cut taxes on the rich while savaging programs for the poor and the middle class, even received an award for fiscal responsibility. Which brings us back to the midterm elections. Rule of law is definitely on the ballot. So is health care. But voters should realize that the threat to programs they count on is much broader: If the G.O.P. holds its majority, Social Security and Medicare as we know them will be very much in danger. A popular solution to the nation's healthcare woes. That's the future in the U.S., not Obamacare. Last month's upset primary victory by Alexandria Ocasio-Cortez, who beat 10-term incumbent Joe Crowley in a New York City district, was decisive proof: the Democrats’ path to victory requires exciting their base with a bold, fearless agenda that includes Medicare for all. We have seen this strategy prove successful not just for Ocasio-Cortez, but also for Ben Jealous, who won a competitive primary for Maryland governor, and candidates like Kara Eastman, who won her primary against a former congressman in Nebraska. Beyond the benefits of Medicare for All... it’s a winning political strategy. The merits of Medicare for all have been touted by medical professionals, business leaders and health care economists for a variety of reasons: it would help drive down costs, eliminate administrative waste, increase transparency, bring down rising drug costs, and ease the costly burden of health insurance from businesses and individuals. And, beyond the benefits of the policy, it’s a winning political strategy. Despite Democrats' attempts to salvage the Affordable Care Act — a crucial law for millions of Americans — sabotage by the Trump administration and Republicans has proved highly effective. They’ve cut advertising budgets aimed at getting more young people into the insurance pool, repealed the individual mandate which helped balance out healthy and sick people, announced they won’t defend protections against price gouging for people with pre-existing conditions, and justfroze billions of dollars in payments meant to help insurers cover sicker policyholders. As a result, the uninsured rate rose last year for the first time since the bill was enacted in 2010 — 12.2% of Americans are now uninsured. While the ACA has managed to slow the rate of premium increases, they are still rising faster than wages and the inflation rate. To win, Democrats need to do more than just point fingers at Republicans and claim they’re destroying the ACA. Candidates need to take it one step further: Make Medicare for all a central part of their platform. This message draws a clear line in the sand: Republicans want to strip you of your health insurance, while Democrats want to offer low-cost, universal coverage. It’s an endorsement of universal health care that doesn’t waffle, and isn’t complicated. To win, Democrats need to do more than just point fingers at Republicans and claim they’re destroying the ACA. Candidates need to take it one step further: Make Medicare for all a central part of their platform.Unlike the Affordable Care Act, Medicare for all is not difficult to understand, and sells itself on its merits. It appeals to patients drowning in medical debt, doctors and medical professionals buried in paperwork, workers who are shouldering more of their premium costs, and business owners who year after year are forced to devote more resources to keeping their employees insured. It excites a group that Democrats desperately need to get to the polls — younger voters, who strongly support it.. And it shows that a candidate is willing to take on special interests on behalf of their constituents. Voters want to hear a positive message around health care: recent polling data revealed that preserving health care is the top voting issue for Americans. Democrats can be the party offering a bold and viable solution. They need to tell voters how they’re going to make things better, how they’re going to defend health care as a basic right, and how they’re going to create a new system that better serves the needs of patients, workers, small and mid-sized businesses, and the economy. They need to really differentiate themselves from the Republicans and show that they speak for people first, not the insurance and pharmaceutical industries. Medicare for All is more than just the right thing to do, and it’s more than just good policy. It’s good politics. One would be hard-pressed to cook up a more twisted irony. Nashville Public Radio reported over the weekend that the Tennessee legislature is finalizing legislation that would add work requirements to the state’s Medicaid program, kicking at least 3,700 Tennessee workers off their health care. The state’s Republican leaders appear to have no qualms about taking health insurance away from Tennesseans who can’t find work or get enough hours at their job—even though taking away someone’s health insurance isn’t going to help them find work any faster, and can actually make it harder to find and keep a job. Instead, debate around the legislation has reportedly centered on how to pay for the new policy. Lawmakers’ own estimates put the price tag for enforcing the new work rules at $10,000 per person disenrolled from Medicaid—which advocates note could be more than the new policy saves. This is where Tennessee’s proposal gets really evil. Unwilling to foot the bill for their new policy out of the state’s general budget, Republican lawmakers have decided to pay for it with funds from the state’s Temporary Assistance for Needy Families (TANF) program—which provides meager cash assistance to very poor families with children. While news reports, such as the Nashville Public Radio story noted above, make it sound as though Tennessee’s TANF program is flush with unused cash due to a “booming economy and historically low unemployment,” the real story is much more dire. Nearly one-quarter of Tennessee children live below the federal poverty line, making it one of the worst states in the nation when it comes to child poverty. But fewer than 1 in 4 poor Tennessee families with children get help from the state’s TANF program, which is one of the stingiest in the country. A Tennessee family of three lucky enough to get temporary assistance can expect to receive a maximum of $185 per month—or a little over $6 a day. Fewer than 1 in 4 poor Tennessee families with children get help from TANF. Why is Tennessee failing so horrifically to help so many of its poorest children? In part, this failure is the legacy of 1996 “welfare reform,” which converted the nation’s main source of assistance for poor families—then called Aid to Families with Dependent Children—into TANF, a flat-funded block grant with very little accountability for how the money is spent. Many states use TANF as a slush fund to close budget gaps, with just 1 in every 4 TANF dollars going to cash assistance for struggling families with kids. But Tennessee has made an Olympic sport out of diverting TANF funds away from poor families in need of help, squirreling away more than $400 million in unspent funds in recent years rather than using the money to help struggling families with kids avoid hunger and homelessness. Now the state’s lawmakers want to use those unspent funds to bankroll the disenrollment of thousands of struggling Tennesseans from Medicaid. The bill is expected to clear Tennessee’s conservative Senate in the coming days and has the support of Gov. Bill Haslam (R), who is expected to sign it into law. If passed, both the state’s proposed work rules and their proposed pay-for will require the approval of federal health officials. If the state’s scheme gets a thumbs up from the Trump administration, other states will likely follow suit. Kentucky, Indiana, and Arkansas have all received permission from the Trump administration to enact work requirements for Medicaid, following Trump’s widely criticized invitation to states earlier this year, and more than a dozen states are actively seeking similar approval. Many—if not all—of these states are looking for ways to pay for the costly bureaucracy required to implement this type of policy. One would be hard-pressed to cook up a more twisted irony than taking money intended to help poor families with children avoid hunger and hardship and using it instead to take health insurance away from, in some cases, the very same struggling workers and families. But there’s a deeper rot at the core of Tennessee’s plan that cuts across conservative proposals to slash not just health care but food assistance, housing, and more—both in Congress and in the states. And that’s an ideology-fueled willingness to spend whatever it takes to take aid away from struggling workers and families—even when bureaucratic disentitlement costs more than it saves. There’s no reason to expect general readers to intuitively understand that when House Speaker Paul D. Ryan (R-Wis.) says he plans to “reform” entitlements, he means to cut them. I have a simple request to journalists, columnist, pundits, and others writing about forthcoming efforts of Republicans to cut Medicare, Medicaid, Social Security, and the anti-poverty programs that make up our safety net. Call such efforts “cuts.” Do not call them “reforms,” “changes,” “overhauls,” “fixes,” “reshaping,” “modernizing,” or any other euphemism that could easily be misconstrued. At least, do not do so without also clearly defining what they really are, which is cuts. While D.C. insiders speak the unique creole of our swamp, there’s no reason to expect general readers to intuitively understand that when House Speaker Paul D. Ryan (R-Wis.) says he plans to “reform” entitlements, he means to cut them. Journalists, in particular, should not do Ryan et al.’s bidding by assuming readers get the meaning behind the words. Examples abound. To be fair, these are often otherwise informative pieces, but they sometimes adapt the intentionally obfuscating language of those who would cut these programs. CNN: “The House GOP caucus plans to work on entitlement reform next year as a way to ‘tackle the debt and the deficit,’ according to House Speaker Paul Ryan. … Ryan also noted that, in addition to health care, the GOP plans to work on reforming the US welfare system.” To its credit, the piece later cites Sen. Bernie Sanders (I-Vt.) saying these reforms are really cuts, but why set this up as “he said, she said?” Ryan is talking about cuts, plain and simple, but lacks to courage to say so. His position should not be accommodated. This Politico report talks about Ryan’s “obsession” with “fixing” the “ballooning entitlement state” and “tinkering with the social safety net.” Who could possibly be against “fixing” something! And “tinkering” certainly sounds awfully benign, especially in contrast to Ryan and the Republican’s actual, articulated plans to significantly cut programs that help low-income households. Let me be clear. I’m not arguing against such cuts, at least not yet (that comes in a moment). Those advocating cuts to these programs have every right to make their case. But they’ve no right to mislead, which is, of course, the reason they employ such gilded language. And the media has no right to help them do so. To the contrary, it has an obligation to cut through their linguistic fog. Along with the euphemisms for cuts, here are some other words and arguments politicians use to prevent us from understanding what they’re actually talking about. Unsustainable: This is one the most misused, misunderstood words in budget debates. To say a program is unsustainable is almost always meaningless. Instead, what’s really being said here is that the politician is not willing to advocate for the resources necessary to meet the obligations of a program he disfavors, compared with one he likes. Medicare is unsustainable. Defense spending must go up. It is unquestionably the case that our aging demographics mean that for a period, the costs of fully funding Social Security and Medicare will rise in a way that by 2035, they will require another 3 percentage points of GDP (1.3 for Social Security and 1.7 for Medicare/Medicaid). We can and should have good arguments as to whether that’s the best use of 3 more points of GDP, but there is no coherent argument that it would be impossible to do so. The deficit, the debt! President Trump and the Republicans just added at least $1 trillion to the 10-year deficit with their deficit financed tax plan. Based on their rhetoric of extending tax cuts they themselves scheduled to expire, the hit to the debt could be twice as large. By so doing, they sacrificed their tactic of using bigger deficits as leverage to cut spending programs they oppose. Yes, I know they argue that the tax cuts will more than pay for themselves through higher growth rates, but that just makes my final point. Cherry picking the scores. During the tax debate, the blogger Kevin Drum made an important point: If the tax cuts are going to lift growth as much as the Republicans say, then revenue generated by that growth can also help pay for social insurance and safety net programs. True, they cooked up those growth effects to sell the tax cuts, but they should be pressed to explain why, if they really believe the economy will now be growing much faster, the new revenue flooding in should only pay for regressive tax cuts as opposed to progressive social programs. I’ve long maintained that the policy media has seriously picked up its game in the age of Trump. Both on health care and taxes, more often than not, journalists cut through the phony language and clearly identified who was expected to win and lose from the proposals. They say here at The Washington Post that “Democracy Dies in Darkness.” That’s surely true, and when we force the powerful to speak plainly, we light a match in the darkness. With that, bye-bye 2017! Don’t let the door hit you on the way out. Jared Bernstein is a senior fellow at the Center on Budget and Policy Priorities and previously served as an economic advisor to the Obama administration. The ink was barely dry on the PPACA when the first of many lawsuits to block the mandated health insurance provisions of the law was filed in a Florida District Court. The Constitution nowhere authorizes the United States to mandate, either directly or under threat of penalty, that all citizens and legal residents have qualifying health care coverage. It turns out, the Founding Fathers would beg to disagree. In July of 1798, Congress passed – and President John Adams signed - “An Act for the Relief of Sick and Disabled Seamen.” The law authorized the creation of a government operated marine hospital service and mandated that privately employed sailors be required to purchase health care insurance. Keep in mind that the 5th Congress did not really need to struggle over the intentions of the drafters of the Constitutions in creating this Act as many of its members were the drafters of the Constitution. And when the Bill came to the desk of President John Adams for signature, I think it’s safe to assume that the man in that chair had a pretty good grasp on what the framers had in mind. During the early years of our union, the nation's leaders realized that foreign trade would be essential to the young country's ability to create a viable economy. To make it work, they relied on the nation’s private merchant ships - and the sailors that made them go - to be the instruments of this trade. The problem was that a merchant mariner’s job was a difficult and dangerous undertaking in those days. Sailors were constantly hurting themselves, picking up weird tropical diseases, etc. The troublesome reductions in manpower caused by back strains, twisted ankles and strange diseases often left a ship’s captain without enough sailors to get underway - a problem both bad for business and a strain on the nation’s economy. But those were the days when members of Congress still used their collective heads to solve problems - not create them. Realizing that a healthy maritime workforce was essential to the ability of our private merchant ships to engage in foreign trade, Congress and the President resolved to do something about it. Enter “An Act for The Relief of Sick and Disabled Seamen”. I encourage you to read the law as, in those days, legislation was short, to the point and fairly easy to understand. Health Care in America: Where is the Socialist Solution? The introduction of the Republican legislation to “repeal and replace” Obamacare is no more than latest scrimmage in the ongoing one-sided war against the poor and working class. The “Affordable Care Act” (ACA, better known as Obamacare) proved to be both unaffordable and unable to provide comprehensive care for millions. Nevertheless, with the ACA being one of the only tangible “victories” Democrats could claim for an administration with a dismal record of noteworthy accomplishments, neoliberal Democrats and the party’s liberal base led by Bernie Sanders are now coalesced around the ACA and have vowed to defend it to the bitter end. Yet, camouflaged by the hot rhetoric of confrontation and the diversionary struggle of the duopoly, the common agenda and objective interests being protected in this healthcare battle are quite clear. No matter what version of the healthcare bill passes or if the ACA remains in place, it will be a win for the market-based, for-profit beneficiaries of the U.S. system. As long as healthcare remains privatized, the real winners of healthcare reform will continue to be the insurance companies, hospital corporations and pharmaceutical and medical device companies. That commitment to the interests of the insurance/medical complex ensures that the interests of healthcare consumers, the uninsured, the elderly and the sick will continue to be sacrificed to maintain a healthcare delivery system in which thousands suffer premature deaths from inadequate preventative treatment, millions are unable to afford coverage and millions who have private insurance fear using it because of prohibitive co-pays and deductibles. Obamacare, aka the Affordable Care Act, became law six years ago. The intention was to ensure that nearly all Americans have health insurance, while controlling costs. How did that work out? When the law was enacted, about 16 percent of Americans were uninsured. That has dropped to 10 percent. So instead of 50 million uninsured Americans, there are now about 30 million without insurance. That’s better, but hardly universal. Health cost inflation slowed for a few years, probably because of the recession, but it’s now resuming its rapid growth. In total, the United States spent $8,400 per person on health care six years ago, or $2.6 trillion. Last year we spent $10,000, or $3.2 trillion. Obamacare has no doubt provided health insurance to people who would otherwise have been without it, mainly through an extension of Medicaid in most states, and the creation of shopping exchanges to enable individuals to buy insurance, often with government subsidies. But insurance no longer means what it once did. Businesses are capping their contributions to employees’ health benefits, premiums are increasing, and deductibles and copayments are soaring. There are reports that people who have gained insurance can’t use it because of high out-of-pocket costs. Insurance is becoming hollowed out, and we are learning that health insurance is not the same as health care. The reason Obamacare is unable to expand access and coverage while containing costs is that it made only marginal changes to the underlying factors that make the American health system the most expensive in the world. There are two: First is the spectacularly inefficient private insurance industry, which thrives by refusing coverage for expensive medical conditions and generally denying claims. These companies’ profits, marketing, and other overhead expenditures are so high that when Obamacare restricted them to 20 percent of premiums, it seemed draconian. Compare their costs to Medicare’s overhead of about 2 percent. The second, and perhaps greater, underlying problem is the perverse incentives of providers to perform as many highly reimbursed tests and procedures as possible. These providers include hospitals, whether technically nonprofit or not, for-profit outpatient facilities, such as imaging and dialysis centers, and even specialists whose income is proportional to the high-tech procedures they perform. Other advanced countries spend on average less than half as much per capita on health care as we do, provide truly universal care, and get generally better results, because they have either a single-payer financing system or tightly regulated multiple payers, plus a largely nonprofit provider system. When Bernie Sanders called for “Medicare for All” to replace Obamacare, he was met with objections that it would be too expensive. But that is because of a confusion between government expenditures for health care, and total expenditures, which include employer and individual out-of-pocket costs. Government officials and political candidates usually focus on government costs, particularly Medicare and Medicaid. It would be possible to increase government expenditures for health care, but offset that by eliminating premiums, reducing out-of-pocket costs, and freeing employers from the burden of providing health benefits. The government now pays roughly 65 percent of health costs (including Medicare, Medicaid, government employees, and employer tax deductions). Medicare for All, according to an analysis just published in the American Journal of Public Health, would require that figure to rise to about 80 percent. But these costs would be almost totally repaid by the savings in premiums, deductibles, and other out-of-pocket costs. Moreover, with time, the greater efficiency of Medicare for All would slow health cost inflation. We could gradually adopt Medicare for All by lowering the qualifying age one decade at a time to reduce the disruption. But Medicare as it now stands is not perfect. Although it is a single-payer system within our larger market-based system, it uses the same profit-seeking providers, and its out-of-pocket costs are also growing. And it doesn’t cover everything – for example, long-term care. If the United States extended Medicare to the entire population, it would make sense also to convert to a largely nonprofit provider system. Reducing the perverse role of profit-seeking among providers, with the propensity to over-diagnosis and over-treatment, would yield much greater savings. We could then expand the Medicare benefit package and get rid of out-of-pocket costs altogether. By eliminating the two drivers of health cost inflation in the United States – private insurers and a profit-oriented provider system – we would bring the United States into line with the rest of the advanced world. It will be argued that this idea is “politically unrealistic,” but that hardly justifies not even trying, or imagining that anything else will work. The first step is to tell it like it is. Dr. Marcia Angell is a member of the faculty of global health and social medicine at Harvard Medical School and former editor-in-chief of the New England Journal of Medicine. There’s a lot we don’t know about what Mitt Romney would do if he won. He refuses to say which tax loopholes he would close to make up for $5 trillion in tax cuts; his economic “plan” is an empty shell. Estimates suggest that a Romney victory would deny health insurance to about 45 million people who would have coverage if he lost, with two-thirds of that difference due to the assault on Medicaid. But one thing is clear: If he wins, Medicaid — which now covers more than 50 million Americans, and which President Obama would expand further as part of his health reform — will face savage cuts. Estimates suggest that a Romney victory would deny health insurance to about 45 million people who would have coverage if he lost, with two-thirds of that difference due to the assault on Medicaid. So this election is, to an important degree, really about Medicaid. And this, in turn, means that you need to know something more about the program. For while Medicaid is generally viewed as health care for the nonelderly poor, that’s only part of the story. And focusing solely on who Medicaid covers can obscure an equally important fact: Medicaid has been more successful at controlling costs than any other major part of the nation’s health care system. So, about coverage: most Medicaid beneficiaries are indeed relatively young (because older people are covered by Medicare) and relatively poor (because eligibility for Medicaid, unlike Medicare, is determined by need). But more than nine million Americans benefit from both Medicare and Medicaid, and elderly or disabled beneficiaries account for the majority of Medicaid’s costs. And contrary to what you may have heard, the great majority of Medicaid beneficiaries are in working families. For those who get coverage through the program, Medicaid is a much-needed form of financial aid. It is also, quite literally, a lifesaver. Mr. Romney has said that a lack of health insurance doesn’t kill people in America; oh yes, it does, and states that expand Medicaid coverage show striking drops in mortality. So Medicaid does a vast amount of good. But at what cost? There’s a widespread perception, gleefully fed by right-wing politicians and propagandists, that Medicaid has “runaway” costs. But the truth is just the opposite. While costs grew rapidly in 2009-10, as a depressed economy made more Americans eligible for the program, the longer-term reality is that Medicaid is significantly better at controlling costs than the rest of our health care system. How much better? According to the best available estimates, the average cost of health care for adult Medicaid recipients is about 20 percent less than it would be if they had private insurance. The gap for children is even larger. And the gap has been widening over time: Medicaid costs have consistently risen a bit less rapidly than Medicare costs, and much less rapidly than premiums on private insurance. How does Medicaid achieve these lower costs? Partly by having much lower administrative costs than private insurers. It’s always worth remembering that when it comes to health care, it’s the private sector, not government programs, that suffers from stifling, costly bureaucracy. Also, Medicaid is much more effective at bargaining with the medical-industrial complex. Consider, for example, drug prices. Last year a government study compared the prices that Medicaid paid for brand-name drugs with those paid by Medicare Part D — also a government program, but one run through private insurance companies, and explicitly forbidden from using its power in the market to bargain for lower prices. The conclusion: Medicaid pays almost a third less on average. That’s a lot of money. Is Medicaid perfect? Of course not. Most notably, the hard bargain it drives with health providers means that quite a few doctors are reluctant to see Medicaid patients. Yet given the problems facing American health care — sharply rising costs and declining private-sector coverage — Medicaid has to be regarded as a highly successful program. It provides good if not great coverage to tens of millions of people who would otherwise be left out in the cold, and as I said, it does much right to keep costs down. By any reasonable standard, this is a program that should be expanded, not slashed — and a major expansion of Medicaid is part of the Affordable Care Act. Why, then, are Republicans so determined to do the reverse, and kill this success story? You know the answers. Partly it’s their general hostility to anything that helps the 47 percent — those Americans whom they consider moochers who need to be taught self-reliance. Partly it’s the fact that Medicaid’s success is a reproach to their antigovernment ideology. The question — and it’s a question the American people will answer very soon — is whether they’ll get to indulge these prejudices at the expense of tens of millions of their fellow citizens. 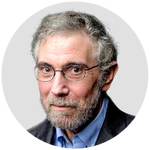 Paul Krugman is professor of Economics and International Affairs at Princeton University and a regular columnist for The New York Times. Krugman was the 2008 recipient of the Nobel Prize in Economics. He is the author of numerous books, including The Conscience of A Liberal, The Return of Depression Economics, and his most recent, End This Depression Now!. If Americans who are embracing Rep. Paul Ryan's "Path to Prosperity" -- and that now includes Mitt Romney -- spent a few minutes reviewing a few recent research reports, they just might conclude that the Wisconsin Republican's plan to reduce the deficit might better be renamed the "Path to the Poorhouse" because of what it would mean to the Medicare program and many senior citizens. Ryan's proposal, which will get new scrutiny now that Romney has made him his running mate, would end the current Medicare program for everyone born after 1956. It would replace Medicare with a system in which beneficiaries would receive a set amount of money from the government every year to buy coverage from private insurers. That money would go straight into insurance companies' bank accounts, which would make them far richer and even more in control of our health care system than they already are. While the amount of money beneficiaries would receive would depend on their health status, the average 65-year-old would get $8,000 under the Ryan plan in 2022, the year it would take effect. That's the amount the current Medicare program is expected to spend on the average 65-year-old that year. After 2022, the annual increase in the "premium support" payments would be based on the consumer price index (CPI). And therein lies one of the biggest problems for anyone hoping to live long enough to enroll in Medicare and stay alive for a few years. Last month the government reported that the consumer price index had increased 1.7 percent between June 2011 and June 2012, meaning we've been paying on average 1.7 percent more this year than last year for goods and services. The cost of medical care, however, shot up 4.3 percent -- more than two and a half times the CPI. And that was not an aberration. The cost of medical care has been rising faster than the cost of just about everything else in this country for years. That's one of the reasons why private health insurance premiums have been increasing so rapidly. That and the fact that insurance corporations have to report a big enough profit every quarter to satisfy their shareholders and Wall Street analysts. Health insurance premiums rose nine percent in 2011 to an average of $15,073 for an employer-subsidized family plan, according to the Kaiser Family Foundation. Over the past 10 years, premiums have increased a "whopping" (Kaiser's word) 113 percent, much faster than wage increases and general inflation. So you can see what almost certainly would happen to Medicare beneficiaries beginning in 2022: They would have to shell out more and more money out of their own pockets every year just to cover the premiums their private insurers would charge them. That's bad enough, but consider this: Health insurers began implementing a strategy several years ago to move all of us into high-deductible plans, meaning every one of us will soon be paying (if we're not already) thousands of dollars of our own money for medical care before our insurance company will pay a dime. Insurers adopted this strategy because they have failed miserably at controlling health care costs. If you can't control those costs, the only way you can make Wall Street-pleasing profits if you're an insurer is to keep hiking premiums and shifting more of the cost of care to policyholders. Under the privatized Medicare program Ryan envisions, the effect of that cost-shifting strategy would be disastrous for the growing number of senior citizens who are finding that every year they have less and less money to make ends meet. Almost half of Americans now die with virtually no financial assets, according to a recent study by economics professors at Harvard, MIT and Dartmouth. They found that 46.1 percent of Americans are now dying with less than $10,000 (19 percent die with no financial assets at all) and that many rely almost entirely on Social Security benefits for support. Not surprisingly, those people are disproportionally in poor health. "With such low asset levels, they would have little capacity to pay for unanticipated needs such as health expenses or other financial shocks or to pay for entertainment, travel, or other activities," the professors wrote. Those findings are not so surprising when you look at other recent measures of Americans' wealth and our ability -- actually, our inability -- to save money. The Federal Reserve reported in June that, after adjusting for inflation, median family income fell to $45,800 in 2010 from $49,600 in 2007. The recent economic crisis also took a big toll on median home equity, which fell during the same period from $110,000 to $75,000, and family net worth, which plummeted 40 percent from $126,400 to $77,300. For the relatively wealthy Americans lucky enough to have a 401(k), most of their account balances are not nearly high enough to be of significant help when they retire. According to Fidelity Investments, the country's largest 401(k) administrator, the average account balance among its customers at the end of June was $72,800, which is down 2.4 percent from March and about the same as it was in June 2011. And balances in Health Savings Accounts are also low -- averaging just $1,494 in 2010, according to J.P. Morgan. So one has to wonder how Messrs Ryan and Romney think making our senior citizens pay a lot more for care under a privatized Medicare program could even remotely be a Path to Prosperity for most of us. Could it be that they're not thinking -- or even caring -- about most of us but about people who, like them, have such big 401(k) accounts they'll be able to do just fine in their golden years regardless of how Medicare is structured? Wendell Potter is former Vice President of corporate communications at CIGNA, one of the United States' largest health insurance companies. In June 2009, he testified against the HMO industry in the U.S. Senate as a whistleblower. He is now the Senior Fellow on Health Care for the Center for Media and Democracy in Madison, Wisconsin. What the World Needs Now? - More Cooperation or More Competition? When I was a graduate student at UCSD in the midst of the anti-war movement, protesting the war in Vietnam, I went to the library and pondered what would make the world a better place, what could I do to contribute something that might make war less likely and peace time activity more likely. I concluded that more cooperation was needed. More ways to resolve conflicts big and small. For example, democratic voting systems resolve conflicts in such a way that solutions are found that are acceptable to all parties for the most part. I took it for granted that institutions that provided for more cooperation and less competition were more desirable. I thought that this was what the Enlightenment was all about. My heroes were the Enlightenment superstars: Jeremy Bentham, John Stuart Mill, Rousseau, Diderot, Voltaire, John Locke. As I sat there and went through the stacks, I discovered another field and another set of superstars. Social choice has a long history going back to the French Enlightenment philosophers, the Marquis de Condorcet and Jean-Charles de Borda, and even further back than that. One of the 19th century superstars in this field was none other than the Rev. C. L. Dodgson otherwise known as Lewis Carroll, the author of Alice in Wonderland. These guys came up with voting systems which are essential to democracy and are essential to the whole notion of cooperation and conflict resolution. The most recent work in this field was by Kenneth Arrow who published a book Social Choice and Individual Values in the 1950s which attempted to generalize conflict resolution in society in both the political and economic spheres. Arrow concluded that this was impossible and came up with his famous Impossibility Theorem which was a generalization using sophisticated mathematics of the paradox of voting that was known to Condorcet hundreds of years ago. Therefore, Arrow concluded democracy was impossible and any economic system other than capitalism was impossible too. Hmmm, I thought, this is obviously a cop-out because some political and economic systems are more desirable than others and Arrow has done nothing except to throw cold water on any framework that could consider these. I took it as my self-assigned task to prove that Arrow was wrong, that social choice is possible. My work can be found on the website Social Choice and Beyond. In “Social Choice and Individual Values,” Kenneth Arrow said , “In a capitalist democracy there are essentially two methods by which social choices can be made: voting, typically used to make ‘political’ decisions, and the market mechanism, typically used to make ‘economic’ decisions.” This paper resolves that dichotomy by developing a meta-theory from which can be derived methods for both political and economic decision making. This theory overcomes Arrow’s Impossibility Theorem in which he postulates that social choice is impossible and compensates for strategic voting, an undesirable aspect of decision making according to Gibbard and Satterthwaite. Thus the politonomics meta-theory spawns both political and economic systems which are indeed possible and which cannot be gamed. In a typical voting system the outcome of an election among several candidates results in one realized outcome – the winner of the election - which applies to all voters. In a typical economic system, a consumer may choose among a variety of possible baskets of consumer items and work programs with the result that multiple realized outcomes are possible with a unique or quasi-unique outcome for each worker/consumer. As the number of possible realized outcomes of a political-economic decision making process increases, the process becomes more economic and less political in nature and vice versa. We show that as the number of possible realized outcomes increases, voter/consumer/worker satisfaction or utility increases both individually and collectively. I never considered, as I sat there pondering, that there would be people who would argue that what the world needed was not more cooperation but more competition, but, as I sit here today, I realize that the whole conservative right wing is in favor of just that. They want not more cooperation in either the political or economic realm but more competition believing that only winners should prevail and human progress is only possible when you give free reign to those among us who are the most talented, intelligent and ambitious. They believe that competition will result in the strongest among us winning just as Nietzsche believed that a good war hallows every cause. Their ethic is that the naturally gifted elite should prevail, and they are not concerned about what happens to the rest of us or of who is trampled in the process. This is also the philosophy of Ayn Rand as espoused in her novels Atlas Shrugged and The Fountainhead. The debate today about increasing inequality in the world has to do with the prevalent conservative belief that only the strong should survive and be promoted and that freedom should preclude equality as a value. The rich should get more tax breaks because they are the true instigators of human progress and should be catered to at every turn. Perhaps a few crumbs will trickle down to the rest of us. This kind of thinking is counter to the Enlightenment and is fast returning us to a neo-Dark Age. No more is human progress to be measured in reduction of poverty and extension of basic services like health care to everyone. It is to be measured in terms of the great advances to human civilization like iPads, iPods and iPhones. People who are capable of coming up with these advances should be cut every break and none of the billions of dollars they make should be transferred by government to the least of these among us like the homeless, the poverty-stricken and the destitute because, well, they are the least among us, not the best among us who should be given every break. Nevertheless, I remain in the camp of those who think that more cooperation in the political and economic spheres will do more for human progress than more competititon. I also have spent about 40 years in my spare time trying to prove that Arrow was wrong, that social choice is not impossible and that democracy in both the political and economic spheres is not only possible but desirable. This has a lot to do with voting systems, democratic institutions and constitutions but also with cooperative economic systems in which freedom is seen not as the freedom to make money at other people's expense (the losers in the competitive struggle) but the freedom to work as much or as little as one chooses and in accordance with one's preferences as much as possible. Freedom from work is for many people just as desirable a goal as the freedom to make billions of dollars, and wealthy people who don't have to work would be the first to tell you that. Economic democracy in my view is more desirable than cutthroat capitalism, and can be practiced not only at the national level, but at the enterprise level in the form of co-ops like the Mondragon Corporation. Marx's famous definition of the "good society" was "from each according to his ability, to each according to his needs." This of course was perverted in defining communism as a society where all the wealth created by those who had a lot of talent and ability as well as a strong work ethic combined with those who had not so much in those categories would be thrown into a pot and then divided up in equal portions and handed out by the government. Such need not be the case in achieving the "good society." The "needs" part is pretty basic and could probably be accomplished with abouit 10% of the wealth that exists in the world today. Most people can provide for their own needs - no transfer necessary. There are some who cannot and to transfer a small part of the wealth of the wealthy to provide for their basic needs seems to me to be no more than humane. That still leaves the vast amount of wealth in the hands of the wealthy. In other words if you total up how much it would cost to provide for all the basic needs of everyone in the world and tote up how much wealth there exists in the world, it would take a fraction of all that wealth to provide the basic needs for everyone who cannot provide for their basic needs themselves who turn out to be mainly children, seniors and handicapped (whether physically or mentally) people. A recent documentary by German TV station Deutsche Welle pointed out that half the world's production of food is wasted because super markets only want perfect vegetables and ones with slight blemishes are thrown out even though they are perfectly edible. Shelves need to be fully stocked with bread right up till closing hours even though any bread left over at the end of day will be thrown out as "day old." All the food that is thrown out by advanced nations is enough to feed all the world's hungry three times over although no governments or other institutions, much less the supermarkets themselves, seem to be interested in organizing that effort. This is what I mean by the fact that the basic needs of all the world's people could be satisfied without subtracting much if anything from the world's wealthy although a lot of them would admit they do not need incomes of millions of dollars a day like the Fortune 400 billionaires have. Another documentary noted that Finnish school children have the highest test scores in the world despite the fact that they have one of the world's shortest school days with 15 minutes intermissions between classes during which time they are encouraged to go outdoors and play. All grades have large amounts of music, art and self-defined projects. They don't teach to the test. They are concerned with the development of each student as an overall human being not just as some super competitive cog in a nationally competitive machine. The Chinese on the other hand have the opposite approach demanding that children learn by rote methods and extra hours in school and at study. The Finnish schools are all public and everyone is accepted into every class. There are no advanced classes or tracking of students into lesser classes if they are not among the elite intellectually. Everyone is thrown in together; yet they have the best outcomes of any country in the world on standardized international tests. Egalitariansim seems to gain the best results. An egalitarian ethic in which the concern is for the development of the whole human being rather than a promotion of just those who have superior abilities in accordance with a competitive ethic seems to me to be the most humanitarian way to treat both children and adults. The 1948 Universal Declaration of Human Rights already provides for most of the "from each according to their abilities, to each according to their needs" ethic. It calls for free health care which most advanced socierties, with the exception of the United States, already provide. It calls for free education and other public institutions and covers most basic human needs including food and shelter. (2) Motherhood and childhood are entitled to special care and assistance. All children, whether born in or out of wedlock, shall enjoy the same social protection. (1) Everyone has the right to education. Education shall be free, at least in the elementary and fundamental stages. Elementary education shall be compulsory. Technical and professional education shall be made generally available and higher education shall be equally accessible to all on the basis of merit. (2) Education shall be directed to the full development of the human personality and to the strengthening of respect for human rights and fundamental freedoms. It shall promote understanding, tolerance and friendship among all nations, racial or religious groups, and shall further the activities of the United Nations for the maintenance of peace. (3) Parents have a prior right to choose the kind of education that shall be given to their children. All the basic needs of everyone on the planet could be provided for without subtracting much of the wealth of the rich since most people can provide for at least their basic needs without any transfer of wealth whatsover being necessary. Interestingly, the US among other nations does provide food security for the poor through its food stamps program. And of course seniors are provided for through Medicare, Medicaid and Social Security, programs which conservative free marketers are anxious to change or eliminate. I am with the Enlightenment thinkers especially the English utilitarians like Jeremy Bentham and John Stuart Mill who thought about the happiness of society as a whole and concluded that everyone counted, not only the ones with exceptional talent, ability and other admirable qualities. A society should be judged by how it treats "the least of these my brethren" which is the core and essence of Jesus' teachings but, sad to say, not the core and essence of Christianity as it exists in the world today. Perhaps we should start thinking about an alternative constitution for the US which has the world's oldest constitution (236 years old!) while being the world's youngest advanced nation. Other societies including most European societies while being older than the US have newer constitutions. As far-sighted as the Founding Fathers were, a new and updated constitution incorporating not only political but also economic rights along the lines of the UN Declaration of Human Rights would do much to right the wrongs and shortcomings of present day America and the world. Inchoate Demands of Occupy Wall Street: Can They Be Accomplished Without a Revolution? Much has been said about Occupy Wall Street's lack of particular demands. However, their inchoate demands are numerous and plentiful, and what they amount to when totaled up is a complete repudiation of the organization of business and government and the way they are now constituted which isn't the way the Founding Fathers envisioned them at all. The way business is being conducted in the US amounts to a transmogrification of American values under the guise of an evolution of those values. America has morphed into a pseudo republic based on lies and hypocrisy, on militarism in the name of rationality, on the worship of money and the legitmation of any means to obtain it. Without getting specific the Occupy movement represents a repudiation of these abhorrent values which represent the corruption of everything Americans used to hold dear in the service of unmitigated greed and a glorification of unlimited wealth regardless of the plight of the vast majority of the people. (1) Getting money out of politics. That encompasses two ideas: that political campaigns should be publicly funded instead of funded by Wall Street and other wealthy interests and that lobbyists should be gotten out of Washington. Right now 40,000 lobbyists swarm Capitol Hill writing legislation in favor of the corporations that pay them an average of $300,000. starting salary to obtain legislation that stacks the cards in the corporations' favor. Is it any wonder tax policy favors the rich and exploits the poor? Does anyone truly think that getting money out of politics can be accomplished without a revolution? No way. The wealthy and the powerful will never back off. They have morphed American democracy into a plutocracy, and Democrats, who by and large have been bought off by the same wealthy interests, are not a true opposition party. They talk out of one side of their mouth while fund raising out of the other. True democracy cannot exist again until politics becomes something other than the tool of monied interests. (2) The rich must pay their fair share of taxes. Tax policy as a result of frenetic lobbying has favored the rich while exploiting the poor. That's the whole purpose of lobbying: to seek tax advantages for the rich at the expense of the poor. That's the whole raison d'etre for lobbyists getting paid their obscene salaries. Reagan and Greenspan were experts at raising taxes on the poor while lowering them on the rich and at the same time obfuscating what they were doing and convincing the middle class that taxes were being fairly raised or lowered on everyone. Not true. Implicit in the tax code is favorable treatment for the upper 1% and an albatross around the neck of the poor and middle class - the 99%. Wealthy Wall Streeters pay only a 15% capital gains tax and benefit from "carried interest" which gives them the same tax rate no matter how many billions they make. And Republicans fight like hell to preserve these tax advantages for the rich, every last penny of them. They will never agree to tax capital gains as ordinary income, a millionaires's tax or a financial transactions tax. Does anyone think that any of these things can be accomplished without a revolution? (3) The filibuster rule. The most antidemocratic tool of the Republican dominated Senate. A return to democracy would require the abolition of the filibuster rule. Does anyone think this can be accomplished without a revolution? The filibuster rule means that the majority does not rule and never will again as long as the present regime holds sway. (4) Health care as a right. Medicare for all. Medicare's overhead is 3%. Private health insurance's overhead is 30%. Health insurance corporation CEOs made an average of $11 million last year while the highest salary paid to anyone in Medicare administration was less than $200,000. That's the reason why health care is becoming so expensive with paltry outcomes. Private health insurance corporations are under Wall Street's thumb. Wall Street demands higher and higher profits and increasing returns for investors. The result comes about from reducing the Medical Loss Ratio (MLR) which is the percentage paid out for actual medical care compared to the percentage paid out to investors and CEOs. I'ts a classic case of profit over people and again Wall Street is the culprit. Is there a theme developing here? Wall Street has its finger in every pie of the economy demanding that profits be placed over people. The Occupy Wall Street movement has pointed its finger at the exact culprit in every facet of American life that needs changing and Wall Street is at the heart of it. Does anyone think the US will join the rest of the world in providing a universal, cost contained health care system without a revolution? There is no way that "reform" will accomplish this. Obamacare was a valiant effort, but, ultimately, it is no complete solution, and its provisions are subject to being rolled back at the first opportunity by Republicans who want to eliminate not only Obamacare but also social security, Medicare, Medicaid and any other social program benefitting the poor and middle class. (5) The student loan crisis. The heart of the student loan crisis is the privatization of the student loan industry. Instead of assisting or subsidizing students to get a college education, privatization has led to the exploiting of students in order to maximize profits. Again Wall Street is at the heart of the problem demanding higher and higher returns for investors. Instead of assisting students, the private student loan industry exploits them burdening them for life with debt which cannot be discharged in bankruptcy. Republicans and Wall Street worked together to change the law in 2006 which now requires students to pay for life to discharge their debt even going so far as to allow garnishing of their social security benefits. Democratic legislation under Obama has rolled back some of these draconian measures but has done nothing to reverse the bankruptcy law of 2006. Again Wall Street has been catered to and profits have been placed above people. Does anyone think students will ever be able to dischartge student loan debt in bankruptcy without a revolution? (6) The foreclosure crisis. Wall Street was allowed to get completely off the hook with regard to mortgage loan modification. The performance of Obama's Home Affordable Modification Program (HAMP) has been underwhelming at best. Housing experts say the $1,000 payments mortgage servicers get for successful modifications, and the lack of consequences for disobeying program guidelines, don't provide enough incentive to modify many mortgages. The well intentioned Obama administration made mortgage modification voluntary on the part of the banks. Guess what? Wall Street has decided it would not "volunteer" to reduce its profits by giving underwater home owners a break. Again the middle class gets screwed in order to maximize Wall Street profits. What was Obama thinking? Does anyone think Wall Street will write down mortgages giving themselves a voluntary haircut without a revolution? Does anyone think Republicans will have a change of heart and suddenly decide to do the right thing with respect to the middle class against the wishes of Wall Street as long as they control at least one branch of Congress or even if Democrats control both branches of Congress and the Presidency as long as the filibuster rule is in effect? Does anyone think mortgages will ever be modified favoring the middle class without a revolution? (7) Jobs. Does anyone think the government will ever create jobs directly by reinstating an FDR style Works Progress Administration (WPA) or Civilian Conservation Corps (CCC) or even an infrastructure bill without a revolution? Will it ever be the policy of the US to be the employer of last resort without a revolution? It'll never happen. Instead, homelessness on an ever increasing scale will become a "normal" part of American life because this is perfectly consistent with capitalism. The impoverishment of millions will become normalized. As Herman Cain says, "If you don't have a job, blame yourself." THe US will join the rest of the underdeveloped world in a world class regression to a society composed of the very rich and an extremely impoverished class of everyone else. (8) Corporations are people; money is speech. The Citizens United Supreme Court decision verified that corporations are people and money is speech. In particular corporations can spend as much money as they want on political advertising. They have an unlimited right to spend as much as they want to get the candidates elected who will do their bidding. They can propagandize to their heart's content, and the easily led lemmings will buy it and follow them off a cliff. There is no other consideration in electoral politics than money. Democracy is irrelevant; plutocracy shall rule the day. Does anyone think that anything short of a revolution will change this state of affairs? (9) The war in Afghanistan should be ended, and the $2 billion per week that the US is spending there should be spent on improving the lives of American citizens. The military-industrial complex budget should be cut in half. The US spends more on its military than all the rest of the world combined. It has over 1000 military bases located in just about every country in the world. This money is being wasted because defense contractors have some of the strongest and most prolific lobbyists on Capitol Hill. According to Prophets of War, Lockheed Martin and the Making of the Military-Industrial Complex by William D Hartung: Lockheed Martin "spent $15 million on lobbying and campaign contributions in 2009 alone. Add to that its 140,000 employees and its claim to have a prescence in forty-six states, and the scale of its potential influence starts to become clear. And while its current political activities are perfectly legal, the company has also been known to break the rules: It ranks number one on the database on contractor misconduct maintained by the Washington-based watchdog group Project on Government Oversight (POGO); according to POGO, Lockheed Martin has '50 instances of criminal, civil or administrative misconduct since 1995.'" So the military-industrial complex of which Lockheed Martin is the leading exponent uses its poltical influence in Washington to make sure it keeps its profits high as Wall Street demands. Again Wall Street is implicated as it demands the highest possible profits for its investors in the military-industrial complex. Instead of overspending on the military-industrial complex, the US should adopt the model that was successfully used recently in Libya. Military goals were accomplished by joining with NATO partners to spread the cost, and not one American life was lost. Does anyone think the powerful defense contractor lobby will back down, and American taxpayer money will be spent primarily on benefitting the American people instead of trying to control and dominate the world without a revolution? The social contract which implied that, if you studied hard, obtained a college degree and tended to your knitting, you would be rewarded with a good job has completely broken down. Corporations have no responsibility to provide anyone with a job. Instead their only allegiance at the behest of Wall Street is to their bottom line. Wall Street demands that they increase profits. They do so not by providing American jobs but by outsourcing jobs to wherever in the world labor is cheapest. Then they turn around and demand that their taxes be lowered and regulations be gutted, and say disingenuously that that is the only way they will hire more people. But they continue to outsource jobs even though their taxes are the lowest of any historical period since the Great Depression and they are sitting on $2 trillion in cash that they prefer not to use employing people. Instead they buy back their own stock and gamble on Wall Street. Each and every public space and institution is under attack by Republicans. Public schools, public parks, public libraries are being defunded as are public teachers, park rangers, librarians, police and firemen. Republican goals are to diminish public spaces and the jobs supporting them so that they can "drown them all in the bathtub" as Grover Norquist wants. Public spaces are being impoverished at the same time private wealth is being enhanced by every means available. Public America is being turned into poverty while private America gains. And when public spaces and public jobs are diminished, the poor and middle class suffer because the rich only use private spaces - private resorts, private universities, private security companies, private libraries, private schools. A country can be rich in private wealth but poor and in debt with respect to public wealth. Such is the fate of the US under Republican rule. The Occupy Wall Street movement is joining with movements all over the world in waking up to the fact that Wall Street is at the heart of the world's problems. They are wise not to particularize their demands because then they would be offered some sham, watered down solution which would do nothing to curtail Wall Street's power and its dominance over not only America's but Europe's political systems. Neither the US nor the euro zone has the guts to stand up to Wall Street and its extensions in Europe because this might lead to another recession. Instead, they put bandaids on the present system in the hopes that they will be able to normalize things even though "normal" means the impoverishment and the indenturization of the majority of the people. California plans to reduce payments to many Medi-Cal providers by 10%. The federal government's approval of the budget-cutting measure raises concerns from doctors and others. The Obama administration will allow California to cut hundreds of millions of dollars from Medi-Cal, a move doctors and experts say will make it harder for the poor to get medical treatment. California plans to reduce rates by 10% to many providers, including physicians, dentists, clinics, pharmacies and most nursing homes, the Centers for Medicare and Medicaid Services announced Thursday. The cuts "will have a real impact on Medi-Cal patients" because fewer doctors will be willing to see those covered by the program, which serves 7.6 million poor and disabled Californians, said Anthony Wright, executive director of Health Access, a consumer group. The head of the California Medical Assn., which represents doctors, echoed the concern. Cindy Mann, deputy administrator of the Centers for Medicare and Medicaid Services, told reporters the action gives California the flexibility it had requested to address its budget shortfall. "We know that the reductions that are being approved today will have significant impact on affected providers, and we regret the very difficult budget circumstances that have led to their implementation," she said. The cuts are expected to save the state $623 million. California spends $14 billion on Medi-Cal, the state's Medicaid program. "The budget actions that the state had to make were very difficult decisions," said Toby Douglas, director of the state Department of Healthcare Services. "But we knew we had to move forward with these reductions." Federal law requires that Medicaid beneficiaries be able to access healthcare services to the same extent as the general population in their area. California health officials will monitor whether the changes will affect that access. The state withdrew a separate request to cut rates to hospitals and to children's medical providers after determining those reductions could make it harder for patients to get care. Yet to be decided is the state's request to add co-pays for Medi-Cal recipients and limit the number of times people can see a doctor. Under that proposal, patients would have to come up with co-pays of $5 for doctor's appointments, $50 for emergency room visits and $100 a day for hospital stays. Most beneficiaries would be allowed to visit the doctor seven times a year. Medicaid pays for medical care for nearly 60 million people nationwide and is jointly funded by states and the federal government. But shrinking state revenue and increasing numbers of enrollees have forced states to cut costs to make up budget deficits. Stimulus money postponed the effects of the recession, but that extra federal funding dried up in June. A 50-state survey released by the Kaiser Family Foundation on Thursday showed that nearly every state has required co-payments, eliminated benefits, moved more patients into managed care or taken other actions to reduce costs. Like California, many states are also trying to control spending by reducing payments to doctors. "All of these things reflect the ongoing, persistent budget pressure that has just accumulated from year to year," said Vernon Smith, one of the authors of the Kaiser report. California, which already spends less per beneficiary than any other state, has led the way in aggressively slashing its programs. Now the government's decision to allow California to move forward with its plans sets a precedent for other states seeking to reduce their Medicaid bills. The California Medical Assn. expressed frustration over the new cuts, saying that physicians could receive as little as $11 a visit. Doctors will have no choice but to stop seeing Medi-Cal patients, said CEO Dustin Corcoran. "You can't pay the bills at these rates," he said. "They are unconscionably low." Federal healthcare reform, which includes a massive expansion of Medicaid, also could be seriously hampered by this new round of cuts, Corcoran said. "They built federal healthcare reform on the foundation of Medi-Cal, and they just destroyed that foundation," he said. "We have a hard time seeing how healthcare reform has a chance of being successful in the state of California after these cuts are implemented."